It goes without saying that basketball is a team sport. All of the players that are involved need to be able to function as a unit. In order to do so, each team member needs to be able to have great passing skills. Unfortunately, this is a skill that actually remains under-emphasized and not drilled enough to hone before games. Whenever you are on any sort of a basketball team, you are going to find that good basketball passing drills are going to help you function better as a team, thus raising your scores each and every game. Teamwork Basketball is way to win matches. Each player of a basketball team will be able to learn and acquire any of the skills that their coaches teach them on every aspect of the game. When it comes to teaching passing, it is crucial that the coach teaches both the skill but also the mentality that goes along with passing.There are far too many players that will think passing is actually something that should be done if they are unable to make a shot. Instead, basketball passing drills will help all players to understand that this is a skill that is an unselfish act that will help include other players and also, keep the opposing team guessing.When teaching passing to players that are younger in age, you need to take both mental and physical limitations into account. The younger the player, the more they will probably lack when it comes to strength needed for some passes. Additionally, a basketball pass that might look open to them may not be simple because they do not possess the experience necessary to understand the time it takes to get from one point to another. Positive reinforcement and teaching will help younger players to thrive when it comes to passing and working on drills will give them confidence on the court.Practicing should work on a variety of passes along with all of their variations. For example with an Air Pass, the pass will travel between two players without even hitting the floor. 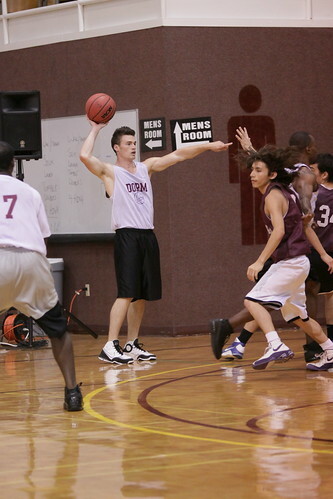 A bounce pass is executed with the same tossing motion, however the ball is aimed at the floor. There will be a certain level of skill necessary with the bounce pass to make sure that a player is able to judge how far away to aim the bounce in accordance to where the ball is to end up. Some will try to bounce pass it about half way to the receiver while others will bounce it in about 3/4 of the way. The more you work on basketball passing drills with your team members, the higher the level of improvement and confidence you will see as a group. When you know all of the best passes that will help you in all situations on the court, there will always be something new and exciting that you can bring to the game. 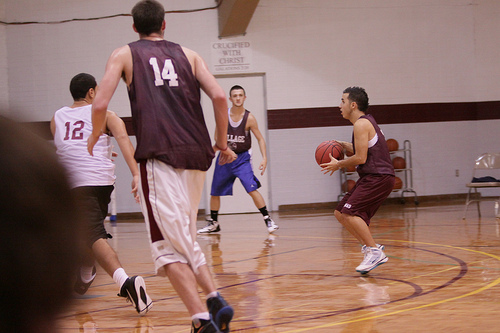 As with any sort of sports or basketball drill, you are going to find that practice certainly makes perfect. Hope you like these tips for teamwork basketball.